WASHINGTON, D.C. -- Lacking money to pay for medical care in the case of a serious illness or accident and running out of money in retirement tie as the most worrisome of eight financial issues Americans rated in a recent Gallup poll. Nearly six in 10 U.S. adults say they are very or moderately worried about each of these long-term financial challenges. About a third are worried about the more pressing concerns of paying their rent or mortgage and meeting their monthly bills. Next, please tell me how concerned you are right now about each of the following financial matters, based on your current financial situation -- are you very worried, moderately worried, not too worried or not worried at all? While not of great concern to majorities of Americans, affording medical costs associated with normal healthcare (44%) and failing to maintain the standard of living they enjoy (43%) are significant concerns to more than four in 10 adults. Slightly fewer Americans, 37%, worry about not having enough money to put a child through college. However, this rises to 70% of adults with children under age 18. Of the financial challenges measured in the April 2-11 Gallup poll, Americans are least likely to be concerned about not being able to make the minimum payments on their credit cards (18%). The rank order of concerns since 2001 has been similar to the one seen this year, although more typically, retirement has edged out major medical expenses as the top concern. More details on these data, including the percentages of Americans very worried about each financial possibility, are available in the PDF document linked at the end of the article. The rank order of financial concerns is fairly similar for retired and nonretired Americans, but the degree to which each group worries about the issues reflects their different life stages. Nonretirees are much more likely than retirees to worry about paying for their children's college and funding their retirement -- there is more than a 20-percentage-point gap in the percentages very or moderately worried about each. Nonretirees are also a bit more likely to worry about paying for normal and critical medical care, as well as housing costs. Retirees' access to Medicare for their healthcare needs likely factors into their greater comfort about affording medical costs. The two groups are the most similar in worrying about maintaining their standard of living, making minimum payments on credit cards and paying normal monthly bills. Retirees' greater financial peace of mind can also be seen in the smaller number of financial matters they worry about compared with nonretirees. Forty-two percent of retirees vs. 22% of nonretirees are not worried about any of the eight financial issues. Conversely, 21% of nonretirees vs. 15% of retirees are worried about seven or eight of them. Beyond age, there are significant gaps in worry by household income, with worry inversely correlated with the amount people make -- the higher the income, the less they worry. There are also sizable differences between non-Hispanic whites and all nonwhites, with nonwhites far more likely to harbor significant financial worries. 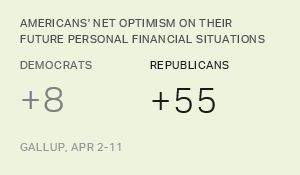 Additionally, consistent with their slightly higher average income and relatively positive views about economic matters with Republican Donald Trump in the White House, Republicans, including independents who lean Republican, harbor fewer financial worries than Democrats and Democratic leaners. 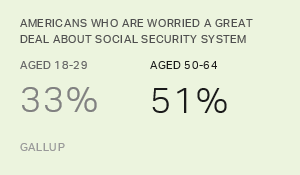 Gallup has tracked Americans' levels of worry about seven of the eight financial matters annually since 2001, while the measure about paying for college was added in 2007. The percentages worried about the seven long-term trends have varied in tandem over that time, increasing during the late 2007 to 2009 recession and remaining elevated until recently. This can be seen in the average very/moderately worried percentage across all seven items from 2001 through today. The current 41% average worry level is consistent with the 38% to 45% range seen since 2013, while down from the 46% to 49% average percentage worried from 2008 through 2012. Financial worry was a bit lower before 2008, averaging below 40% most years. After easing in 2017, Americans' financial anxiety continues to be down from its higher 2008 through 2012 levels during the recession and extended post-recession years. 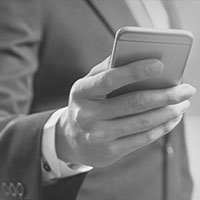 Nevertheless, most Americans have at least one financial worry weighing on them, and about half harbor three or more worries. Concern about funding retirement and paying for serious medical problems is especially pervasive among nonretired adults. Whether the lower concern seen on these and other matters among retirees is something that occurs naturally once people experience retirement for themselves, or that will have to be won through the hard work of saving and planning, isn't clear.